Some days in winter seem to be so dark, like the light switch is turned off. To brighten up these days we have the wondrous gift of the lemon tree of which we have tons of flourishing in New Zealand. I love seeing their glowing yellow globes of fruit. Light bulbs of nourishment! 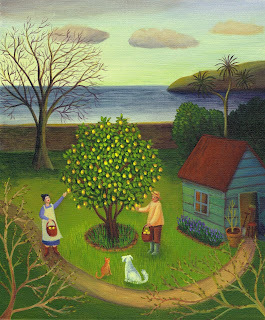 In this artwork I really want to express the glow lemon trees emit. it sits centrally at the bottom of the garden. A storm has passed and the sky in the south is heralding the calm glow of a gentle afternoon. Mr and Mrs Green have been waiting patiently in the warmth of the kitchen for the storm to subside. Lily sets her knitting to one side and gently pushes the cat of the side of the armchair where both had been quite happy in their tasks. For the cat it was watching the clicking needles go back and forth. George had been scanning garden annuals and jotting down ideas on the side of the newspaper. "right then" says Lily "time to go out and have a look what damage the storm might done to the lemon tree. That wind was pretty strong. I wouldn't be surprised if it hasn't tossed a few lemons around the garden"she added. George grunted and the dog woke up hearing the paper being put down and George scrape the chair back at the kitchen table as he got up. "I'll put my gumboots on then" he replied and going to the back door he reached for his battered straw hat he wore since Lily and him had been married. It was his all weather gardening hat. Surprisingly it wasn't that cold just dark and damp however as they wondered down the garden path the lemon tree seemed to glow like it was all lit up like a Christmas tree. Scattered about lay yellow globes waiting to be picked up. The dog pounced on ahead eager to sniff and examine these strange offerings. "That lemon tree is grand isn't Lily"announced George "Just think thirty five years ago when we came here it was just a little sapling, a twig of a tree, now look at it. All grown up, like us and burgeoning with fruit" George was evidently proud of his tree. "Yes" agreed Lily, she often agreed with George when it came to the garden.It was his domain. "lets grab the baskets out of the shed and pick up the fallen fruit and I shall make us a lovely lemon meringue pie for tea" The house and especially the kitchen was Lily's undisputed domain. The cat and dog watched as the couple harvested the Lemons. Lovingly Lily and George placed their prizes into dark red cane baskets. "You know what?" pondered George as he looked towards the tree and then to his wife. "This lemon tree is a little bit like us"
"Really!" chuckled Lily "Like we are sweet and bitter at the same time?" "No, not just like that, but we have been here on this property together since we met and we planted the lemon tree and it is like it's weathered storms and droughts and it still flourishes, a bit like us. We have survived up and downs, the children have grown up here". George smiled lovingly at Lily and hugged her. "and"he added "you still glow." Lily giggled "You old fool"
The couple meandered back up the path towards the kitchen door, followed by the cat and dog. And Lily made her best lemon meringue pie ever.